Seba is the 31st post town from Edo and was the last post town we were to pass through on our journey. Most of the buildings in this town were also burnt in a large fire in 1932. There is also the possibility that widening of the road has eaten into the area that used to be Seba as very little remains of the original post town. We passed Seba Station and then got on to Zenkoji-michi by veering left at a junction with a stone sign with the directions “right to Nakasendo” and “left to Zenkoji-michi at the edge of the Edo side of the post town. During the Edo era the junction was a little further along Zenkoji-michi. 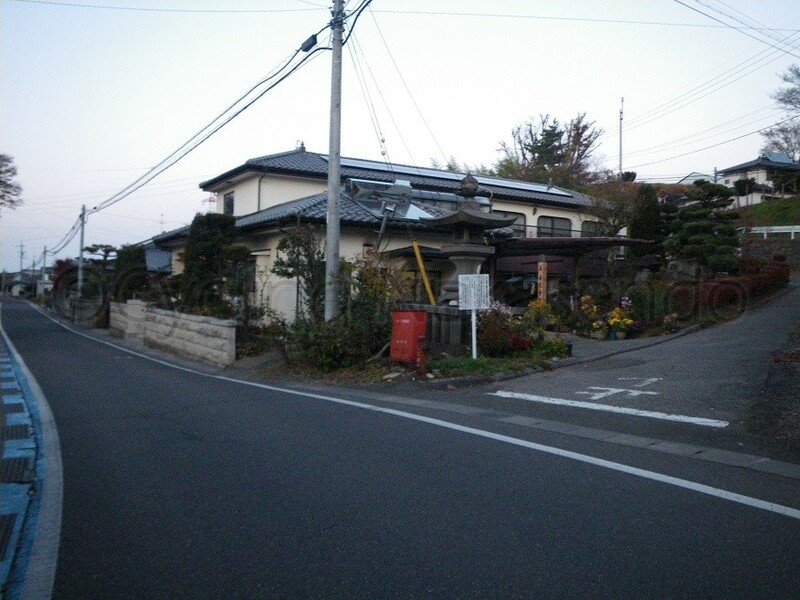 The turn on to Nakasendo on this route is still marked by a stone lantern in front of a house. The formation of this section of Nakasendo indicates the presence of a masugata. From where it meets Nakasendo the sub-highway, Zenkoji-michi passes Matsumoto and eventually reaches Zenkoji Temple. 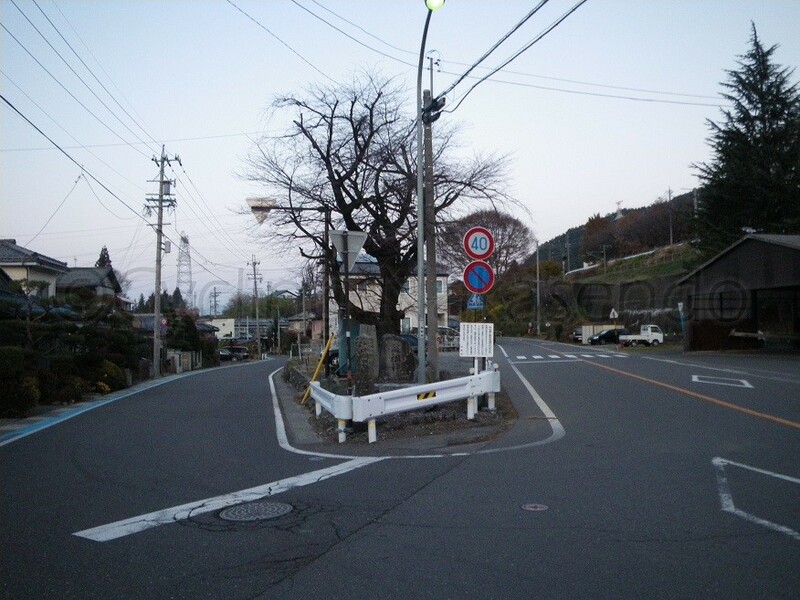 The road earned its name due to being frequented by large numbers of pilgrims travelling to Nagano to visit the temple. Famous haiku poet, Matsuo Basho went moon watching in Obasute and visited Zenkoji Temple via Nakasendo while returning from the province of Mino to Edo in 1688. The inspiration for his famous work, Sarashina Kiko (A Visit to Sarashina Village), which is both a collection of haiku poems and recordings of his travels, came from his journey and the poetry he read while he was travelling. It is recorded that he covered the 250 km distance between Mino Province and Obasute, gruelling due its steep landscape, in a mere five days. At the time he would have been 45 years old. As he would have had strong legs and be carrying a lot of money and necessary documents to pass through post towns and checkpoints smoothly the theory exists that he was actually a ninja. It is 5 km from the junction to Shiojiri. 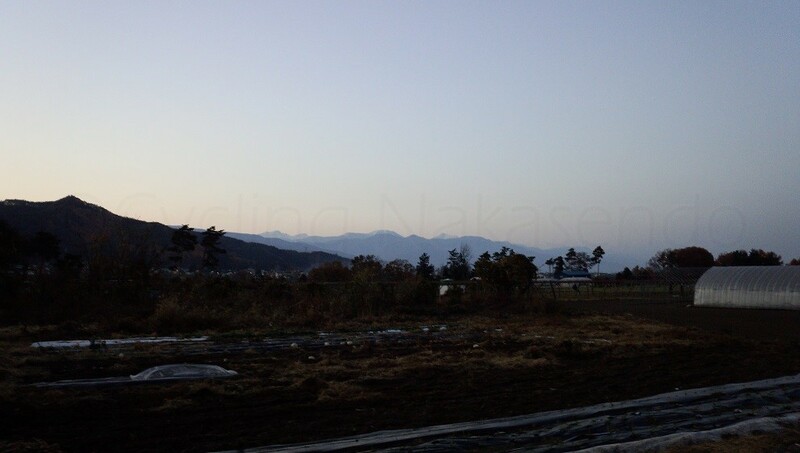 The slope became gentler as we entered the grape growing area of Matsumoto basin. It was probably the snowcapped mountain peaks of Hakuba that we could see rising in the distance framed within a soft gradation of red to blue light as the sun set in the evening sky. 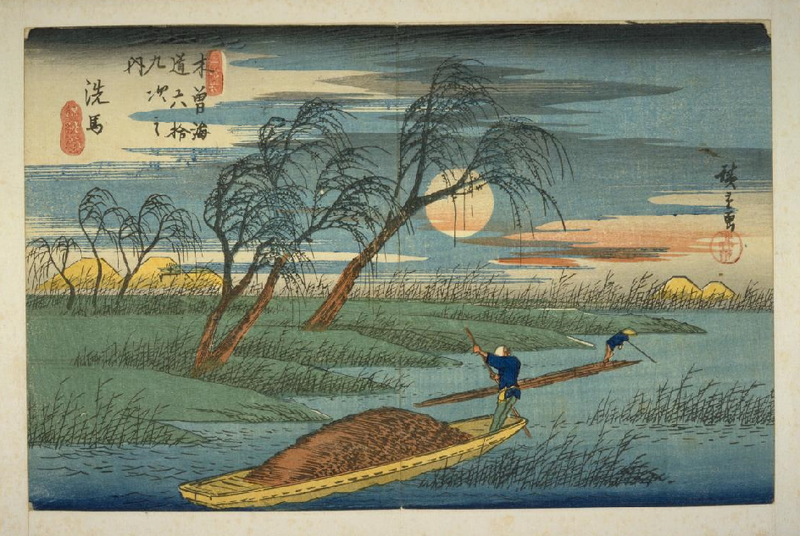 It looked exactly like the evening sky Hiroshige depicted in “Seba” from The Sixty-nine Stations of the Kisokaido. We were so taken in by the beautiful scenery that we managed to go past the intersection where we were supposed to make a right turn. We had intended to reach Shiojiri Station before it got dark but because of this oversight we didn’t reach there until after 4:30 pm, when it was more or less pitch black. We had no choice but to put lights on our bikes and thread our way through the patchwork of old roads leading through fields of grape vines and eventually arrived safely at Shiojiri Station at 5:05 pm. Including the various detours of the day (Torii Toge’s bear drama and having to back track after going too far along Zenkoji-michi and missing our last turn) the total distance for our day was 53.7 km with a total of 549 vertical metres. We took our time disassembling and packing the bikes then made our way to the station’s ticket office (Midori-no-mado-guchi). The next train for Shinjuku was the limited express Azusa leaving at 8:08 pm. As it was a long weekend I was worried that the train would be crowded but luck was on our side and we managed to purchase two reserved seats, then headed to Shiojiri Station’s restaurant for something light to eat. NC ordered oyaki again and I had a beer with local delicacy, deer sashimi. Once on the train back to Tokyo we were both asleep before we knew it. 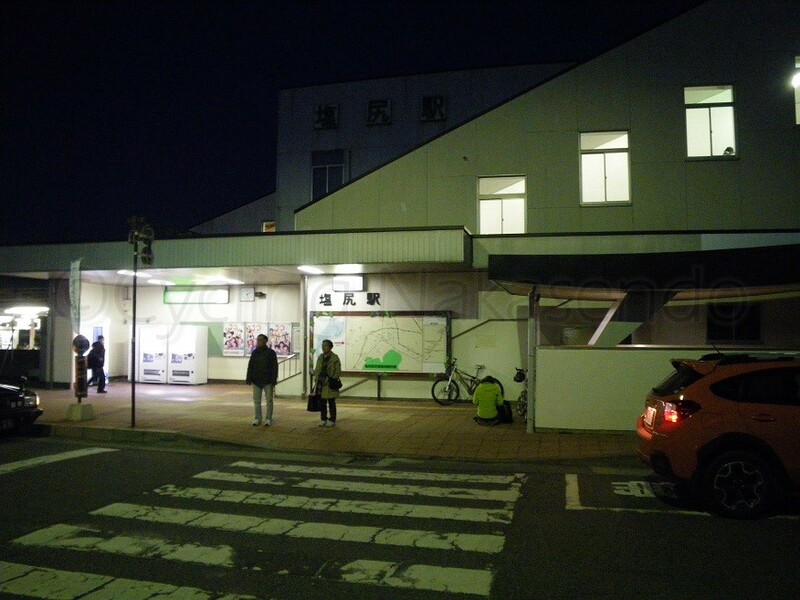 It was completely dark when we arrived at Shiojiri Station… Otsukaresama! I have always enjoyed riding bikes but my interest in finding and exploring ancient roads initially came as a result of trying to avoid heavy traffic. I found that roads constructed for travel on foot or by horse and oxen tended to be easier to ride on and with time this interest expanded to encompass researching the history and culture particular to them. The inspiration for writing a book about Nakasendo (still in progress) from which this blog is a small section, was through a desire to share my passion for exploring and riding along ancient highways. Despite my already existing interest in the history of Nakasendo the ride along this section of the highway provided the opportunity to meditate on our relationship with the natural world and its hand in shaping how we live. Evidence would suggest the people of Edo respected the power of nature, and possessed wisdom in how to live in harmony with it. I wondered whether our advances since then have really made us happy. In contrast, today we seem to want to control nature, we use enormous amounts of energy all of which has negative consequences for our health. Human-powered travel enables us to see things and experience our surroundings in ways we are otherwise unlikely or often unable to. While riding along Kisoji I felt the people of the Edo era were able to communicate the importance of these things through the legacy of what is Nakasendo. It is possible that the Japanese culture and customs that we have inherited have been shaped in part by traditional trade routes. Traveling along Nakasendo is not just a way to explore Japan’s history and learn about the country but rather a way to touch and develop deep understanding of its soul.